I had a dream about a cake. I know it sounds douchey. 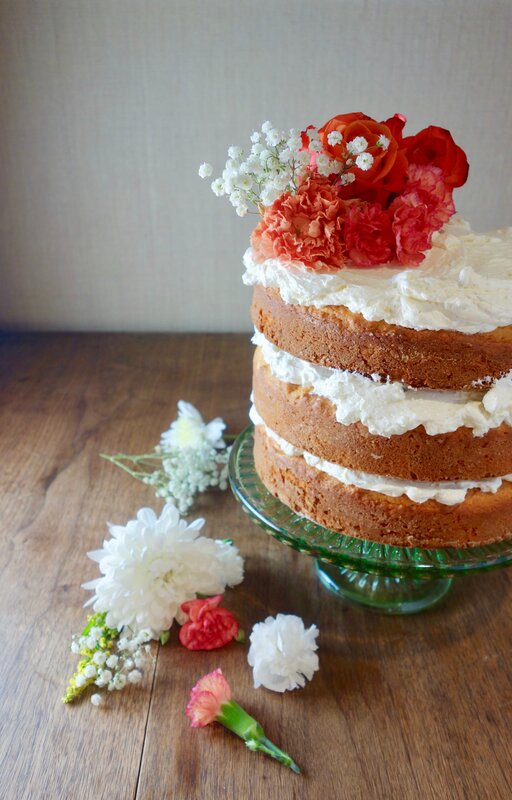 This dream was about an orange bourbon vanilla bean swiss meringue buttercream cake. All layered and covered in flowers. I had this in my head for weeks and I needed it to leave my brain. So, I went ahead and made this cake…then realized I had nothing to do with it. Luckily my friend Kiyomi stopped by to take some off my hands. The rest of it goes to boyfriend’s office tomorrow. So why should you make this cake? Because it’s light, sweet, citrus-y and DELICIOUS. 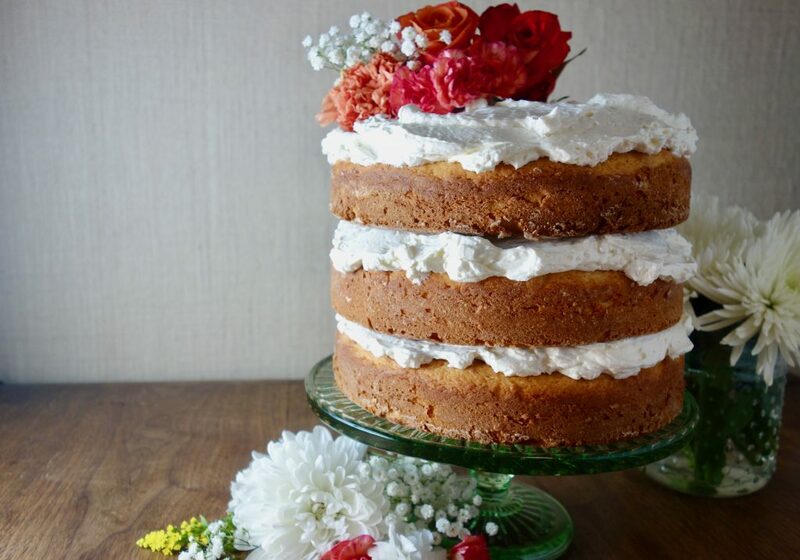 It’s also beautiful when you stack layers of this cake on top of fluffy white vanilla bean frosting. If you like to impress people, it’s the sort of cake you can’t look away from. Want some cake just because? Really, who needs a reason – just get after it! Take three 8 inch round cake pans – butter and flour the pans so the cakes slide right out when they’re done. Turn oven on to 350F. Mix the rest of the flour, baking powder and salt together in a medium bowl. In a large bowl, cream the butter with a hand mixer, then add sugar and oil. Then, beat in the vanilla, orange zest and egg whites and eggs. Mix in orange juice and bourbon. Add in ⅓ of flour, mix until combined. Add in ⅓ of yogurt, mix until combined. Keep going until all the flour mixture and yogurt are incorporated and the batter just becomes smooth. Evenly distribute the batter between the pans. Bake for 32-38 minutes. Cakes are done when a toothpick comes out clean and the tops are lightly brown. Let them cool in the pans for a bit before you take them out and cool on a wire rack. Create a double boiler – bring a couple of inches of water to boil in a pot on the stove. Rest a metal or glass bowl over the water (not touching the water) and crack the egg whites into the bowl and add the sugar. You want the bowl to get warm but not HOT which is why there’s space between the water and the bottom of the bowl. You’ll warm the egg whites and sugar, whisking constantly, until they reach 160F. If you don’t have a thermometer, you’ll know you’ve reached this temp when the sugar has dissolved into the egg whites completely. Reduce to medium speed and add in butter slowly. Finally, add a pinch of salt and the inside scrapings of a vanilla bean. Go ahead and lick the beaters, this is the best frosting in the world.